It was 4 in the afternoon. Busy in downtown Amsterdam. Many tourists were there for holiday. Many languages were flying by my ears. When the bells rang at 4, a quiet settled over the streets. Car radios could be heard, a few voices whispered. But a general quiet blanketed the city. It was a moment of silence for the 193 Dutch passengers aboard Malaysian Airliner Flight MH17 who died when when their plane was shot down July 17. The Netherlands lost the most citizens in that crash, and the sentiment here has been strong. Flags flew at half-mast. A minute of silence was called for at the time the trains would be entering Central Station with the first of the bodies that have been recovered. Such national mourning hasn’t happened since November, 1962, when the Queen Mother, Wilhelmina, died. I’ve been amazed at the sense of national extended family that this has produced. It has felt like it wasn’t just those with loved ones on the plane who are grieving this loss. There’s a sense of collective loss in this small country. 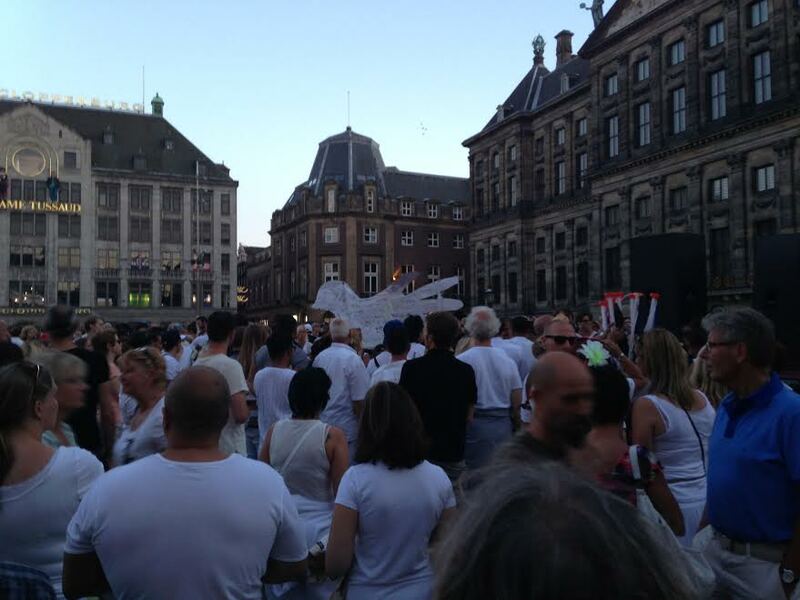 At 8 p.m. a brief memorial happened at the Dam Square. There’s a large statue in the center, and it’s fronted by the Royal Palace. One of three palaces used by the king and queen for public functions. People gathered. Speeches were made. Balloons were released–I saw the white ones float by. Representing life. Hope. There was solace in togetherness. A shared loss, even if it wasn’t personal. A crime against a country. 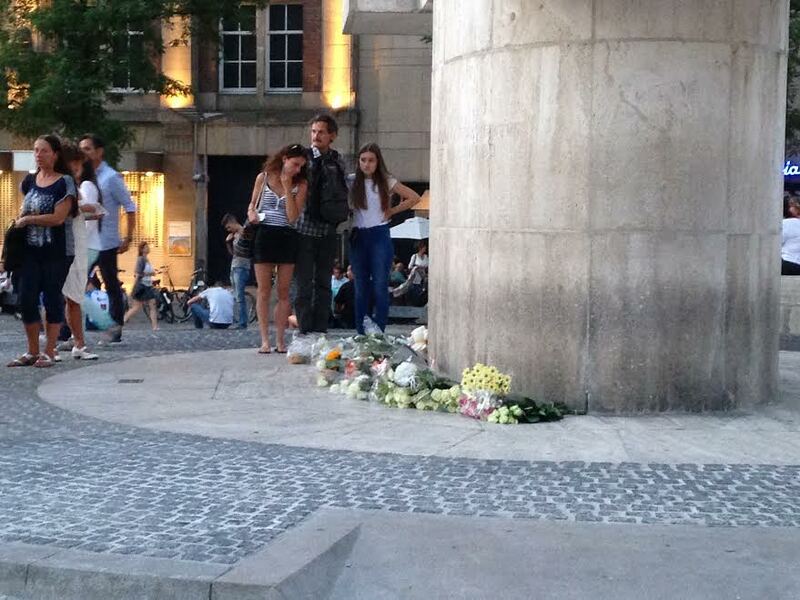 A flower memorial had begun by the statue. Put there by folks who had known and not known those now gone. Someone had mounted a large dove on a stick, filled with signatures and messages of compassion. Bad things happen to really good people every day. Not because we’ve been forgotten by God. Because we live in a very broken, dark world. One where our own choices have made life worse. One where our inconsistencies and selfish desires have sabotaged our attempts at hope. Jesus alone can make the difference. I know this to be true because He’s done it in my life. Amid my wrong choices and bad decisions. If this life is all there is, then tragedies like this one define the futility of all of life. The truth? God made each of us to have a relationship with Him. So that this life is just the beginning. Jesus experienced our broken lives on the cross so we could experience life with Him in eternity. What will your choice be? To live the tragedy? Or the hope? How will the bells ring for you? We will all choose at some point. Posted by daylerogers on July 24, 2014 in Uncategorized and tagged balloons, compassion, crisis, God, grief, Jesus, loss, Malaysian Flight MH17, memorial, mourning, The Netherlands. A clear glimpse at our earthly situation. Clear as a bell, my friend.